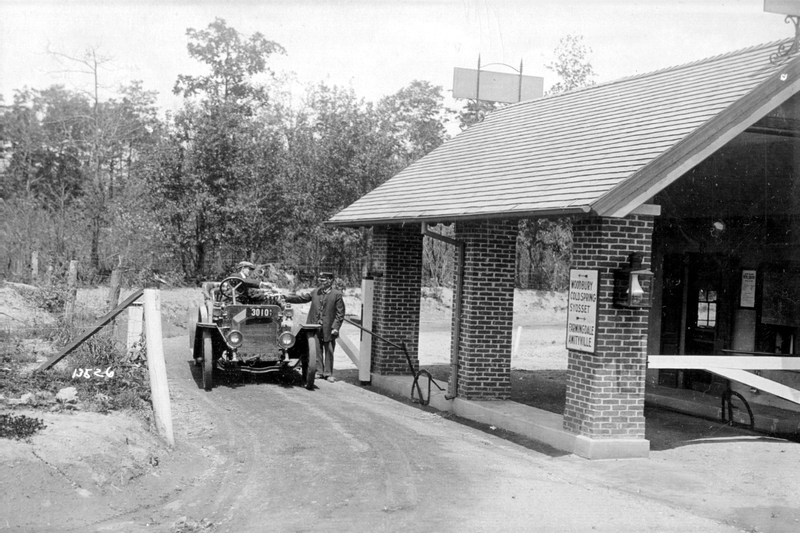 In this photo, lodge keeper Thomas Grafenstein collects the toll from a motorist at the Bethpage Toll Lodge. Click on the image and you can see the direction sign on the wall of the porte cochere. 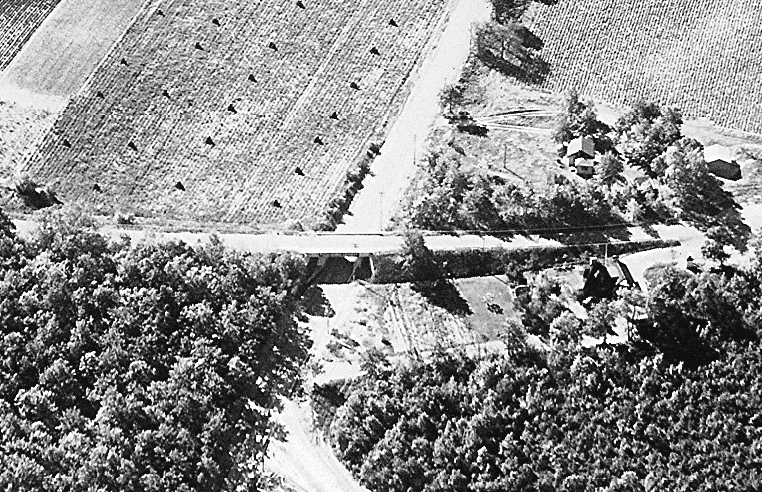 This 1935 aerial shows the Long Island Motor Parkway crossing over Round Swamp Road. The Bethpage Toll Lodge can be seen to the right. Click on the image and you can see the lodge entrance off Round Swamp Road. This image should bring back memories. 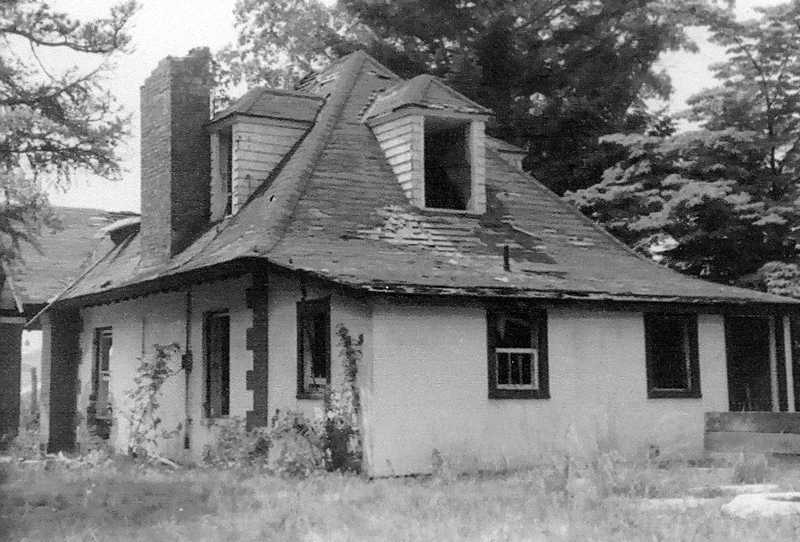 It shows the abandoned lodge in the early1960s. Thank you very much, Howard. That last photo was one of deja vu. I didn’t think a photo still existed. Fantastic website. The building deteriorated even more before it was finally demolished. I also remember vividly the Massapequa Lodge. That building was still at the rear exit of the 8th Precinct stationhouse (at Rte. 107/Hicksville Road) when I worked there in 1963. Thanks for the comment and background on the Bethpage Lodge. I have several photos of the Massapequa Lodge that I will post later this week. So that’s what that dilapidated, abandoned building was (on Round Swamp Rd)! That puts things together.